Fast DVD burner Support DVD-R, DVD-RW, DVD+R, DVD+RW, DVD+R double layer, DVD-R dual layer, mini DVD-R, CD-DA, video CD, photo CD (single and multi-session), CD-text, DC-extra, CD-R, CD-RW, business card CD-R, 3" mini CD-R. The CD DVD duplicator burning speed for full 700MB CD is less than 3 minutes and it takes about 6 minutes to copy full 4.7GB DVD disc. 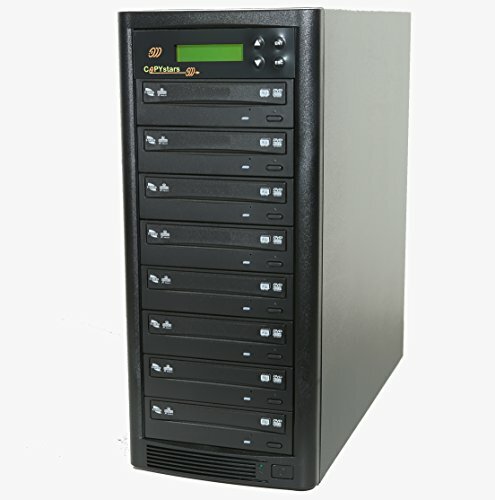 This duplicator is also capable of duplicating dual layer (DL) DVD media discs. Fast DDR2 buffer memory-memory speed 4x faster than competing models using scram. Other features such as: Multi-language support-language is displayed in, English, Spanish, Portuguese or Japanese ,dual-level security-separate startup and setup passwords to prevent unauthorized usage. Advance function included : Priscian, compare, test(simulation of copy),track edit, CD over burn ,firmware update and many more. Maximum DVD burner writing speed: DVD+/-R: 24X, DVD+/-RW: 8X, DVD+/-DL: 8X, CD-R: 52X, CD-RW: 32X. Supported disc formats : DVD-ROM, DVD-R, DVD-Video, DVD-RW, DVD+R, DVD+RW, DVD+R9, CD-DA, CD-ROM Mode 1, CD-ROM XA Mode 2, Multi-session Photo CD , CD-I, Video CD, CD Extra (CD Plus). Supported recording discs : 12cm 4.7GB DVD-R/RW, 12cm 4.7GB DVD+R/RW, 12cm 8.5GB DL DVD, 12cm 80min/700MB CD-R, 12cm 74min/650MB CD-RW, 8cm 1.47GB mini DVD-R, 8cm 24min/210MB mini CD-R, 8cm 50MB Business CD-R. All Copy stars CD DVD duplicator carry 3 years labor and 1 year parts warranty, Unlimited 1800 toll free support.